Grossular should not be called grossularite, grossularite was once a type of rock. 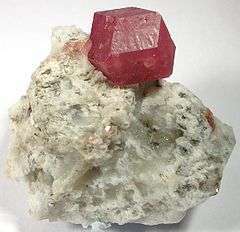 Grossular is known by many other names, and also some misnomers; colophonite – coarse granules of garnet, ernite, gooseberry-garnet – light green colored and translucent, olyntholite/olytholite, romanzovite, and tellemarkite. Misnomers include South African jade, garnet jade, Transvaal jade, and African jade. Color range of grossular graphically displayed at the National Museum of Natural History Washington, D.C.
↑ International Mineralogical Association (1971). "International Mineralogical Association: Commission on new minerals and mineral names" (PDF). Mineralogical Magazine. 38: 102–105. doi:10.1180/minmag.1971.038.293.14. ↑ "Cinnamon-stone". Encyclopædia Britannica. 6 (11th ed.). 1911. p. 376. 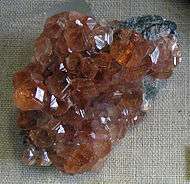 ↑ Note: Hessonite is often called Gomedhaka in Tamil and Sinhalese. Wikimedia Commons has media related to Grossular.